Chris and I, we’re bar people. I say that not because we’re in the bar business (which we are) or because we like to spend our rare bit of free time enjoying good beer and good company in a few of our favorite bars (which we do). I say this because 99 times out of 100 when we go out for a meal you’ll find us seated at the bar rather than at a table. Why this preference, you ask? Well, for one it’s just a lot more social and fun. We get to chat with the bartender and with our fellow bar-dwellers, sharing jokes, stories, and sometimes even our food. But the best reason of all to sit at the bar, and the reason that I recommend you start sitting at the bar sometimes too, is that a seat at the bar is where you get all of the good inside info. Sometimes it’s a crazy drink that only the staff know about, other times it’s an upcoming event that you would never have known about otherwise, and often it’s a tip about somewhere else to eat and drink. Always listen to these tips. People in the bar/restaurant industry always know the best places to eat and drink. It’s our life, after all. A few weeks ago we followed one of these amazing little tips to one of the best burritos I’ve ever had. It all happened because of a quick brunch stop at the always wonderful Alex and Ika Restaurant en route to Brewery Ommegang for an evening of music, beer, and camping. Four seats awaited our little group at the bar as we walked in the door, and we settled in for a tasty brunch while chatting with our bartender. Upon telling this lovely young woman about our plans at the brewery later that afternoon, she clued us in to the local restaurant owned by a couple of twenty-something year old sisters that would be serving up some tasty food at the concert. Had it not been for this tip, we might never have made it to the Origins Cafe food truck. Our extreme hunger (and maybe a bit of drunkeness) might have led us to ordering from the first food vendor we saw. But we were on a mission and we pressed on, all the way to the final food vendor at the very top of the hill. And there it was written in chalk between the mac ‘n cheese and the sweet potato chili: burrito with black beans, quinoa, onions and gouda. So simple. So delicious. So exactly what we needed. Now I may have mentioned we were a little tipsy when we ate these burritos, and I’m sure you all know as well as I do that whatever food you eat when you’re drunk is the best food in the world!!! So of course I just had to know if this particular burrito combo really was as transcendent as I remembered, or if it was just my alcohol-impaired taste buds playing tricks on me. Since we won’t be heading back to Cooperstown to try the real thing for at least another month or two, I cooked up my own version. To the best of my memory, anyway. As it turns out, it really is an amazingly delicious burrito. And even better, I’m going to share with you the incredibly simple recipe right here. Once you’re finished reading, please go straight to your local bar and make friends with the bartender and the other patrons. Then come back here and tell me about all of the great tips you picked up. Believe it or not, this is still pretty amazing without the cheese (vegans, rejoice! ), so feel free to leave it out if you need to. However, if you do eat dairy please do find yourself some nice gouda (smoked, if possible) because it really does add the perfect finishing touch. I prefer using flour tortillas for burritos because I’ve never been able to fold a corn tortilla without tearing it, but feel free to use whatever tortillas you prefer. Or maybe even get really crazy and go tortilla-less! 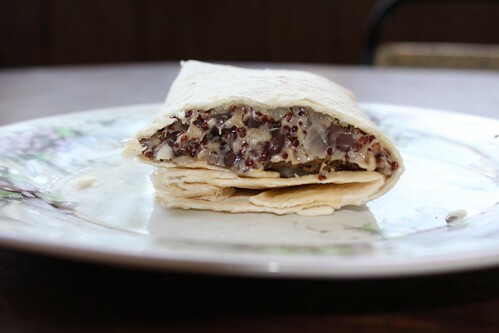 Shanna over at Food Loves Writing recently posted some incredible looking Creamy, Spicy Collard Wraps and I expect this filling would work quite well in a similar wrap. Heat the olive oil, onion, and 1/2 tsp of salt in a skillet over medium heat, covered, until the onions begin to release their juices, stirring occasionally. Uncover and continue to saute until the onions are soft and translucent, and the liquid starts to evaporate. 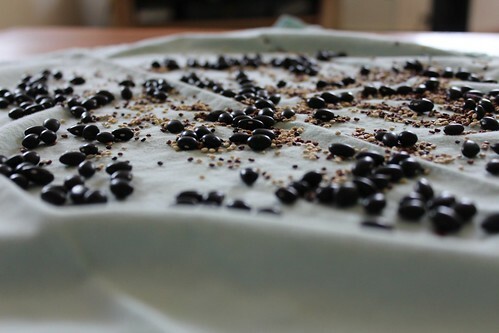 Add the black beans, quinoa, and the rest of the salt and cook, stirring frequently, until hot throughout. Transfer to a bowl and stir in the gouda until melted. Place about 1/4 of the filling in the center of each tortilla and fold into a burrito. If your burrito-folding skills are lacking, there’s a good guide here. I’m loving your food blog. I think this recipe would go perfect with the homemade corn tortillas I make: http://julienolke.wordpress.com/2013/02/18/family-mexican-night-sweet-potato-tacos-with-homemade-tortillas-salsa-and-toppings/ Great job. Give em a try if you get a chance. Hey if you’re interested, keep an eye out for my new video blogs I’m creating and let me know what you think. Thanks, Kristi! Let me know how it turns out if you decide to give it a try. Thanks for the vegan cheese tip! I have yet to try Vegusto. I think I’ll have to track some down for the next time I make these burritos. This looks fab Katie, love the simplicity! And I love the post 😉 Me and T we are bar people too – I work in the restaurant biz and love to catch up with people — and it’s always the way to fit in and get the best tips when traveling for sure!